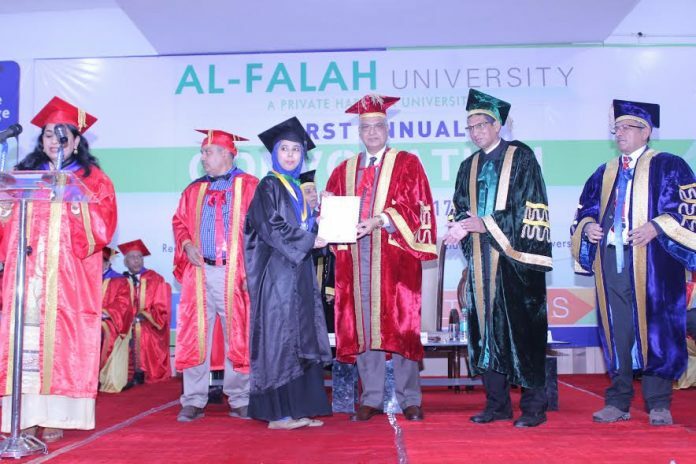 Gurgaon: The Al-Falah University, a State Private University created by an Act of Haryana Government (Act 21 of Haryana Legislative Assembly, 2014), held its 1st Annual Convocation on Monday the 20th March 2017. This university is one of the first universities which has introduced Choice Based Credit System under semester mode examination as per mandate of UGC and two year B.Ed and M.Ed programme as approved by NCTE. It conferred the degrees to successful candidates, who appeared and passed the examinations, conducted in the year 2015 and 2016. 612 Graduate degrees, and 238 Post Graduate Degrees were awarded at the convocation that was held in Al-Falah University, Dhauj, Faridabad on 20th March from 11:00 AM. He saluted the zeal of the founder and the chancellor Mr. Jawad Ahmad Siddiqui for his unwavering enthusiasm and commitment and tireless efforts in surmounting all these challenges and establishing this university. He said that higher education in India has been faced with three eternal challenges. The first and foremost has been the challenge of expanding our higher education system to create enough seats for all those who aspire to receive higher education. The second challenge he said is to make higher educational institutions inclusive by making it accessible by all sections of the society. The third and biggest of all is the challenge of ensuring quality and promoting excellence in higher education. He said that the Al Falah University already has its strategies in this regard chalked out and is proactively working on them. He motivates students & said that you must never get deterred by failures. You must protect yourself against negativity and pessimism. You must remain motivated and keep on acquiring knowledge and honing your skill. Prof. (Dr.) Anil Kumar welcomed the gathering & introduce the Chief Guest & Chancellor and highlighted the activities of the University. He has also given the back ground of the University. Mr. Jawad Ahmad Siddiqui, Chancellor, Al-Falah University at the convocation said “It is a great pleasure and honour for me to deliver the presidential address of this prestigious institution the Al Falah School of Engineering and Technology which was existing for last 20 years is now upgraded into University has completed 03 years of its existence. He also mentioned about the Awards and scholarships, the upcoming facilities and new courses at Al-Falah University. The ceremony was both magnificent and cordial. Around 500 nos. of people were present at the Convocation including University Professors, Deans, guardians and relatives of the scholars bestowed with the degree.